As you probably already know Skype has the ability to update automatically. Changes in new versions may include things like: fixed bugs, fixed security issues, added features (or sometimes removed) etc. In some versions we have the option to disable the Skype updates but in others we have to do some tricks in order to stop them. Even though it is recommended to always use the most recent version, many people still use older versions. Maybe they don’t want to deal with updates or they are just used to the old interface. 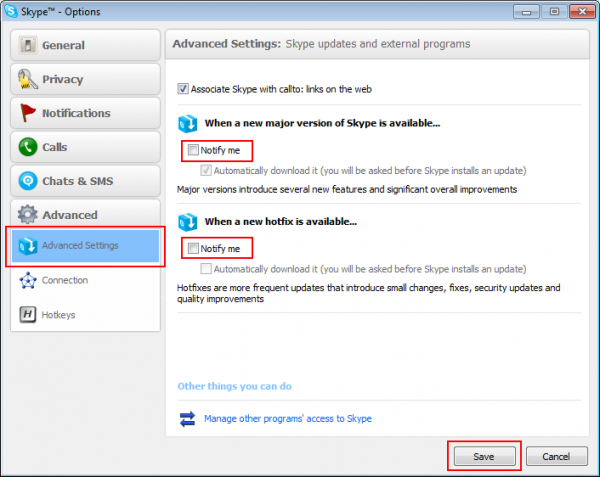 This is why we are going to take a look at some steps we can take in order to stop the Skype updates in each version. Important message! [May 17, 2013] – For some time now, most versions below 3.8 are not working (some people even report the same for 3.8). When we sign in we are forced to update for security reasons. Open Skype and sign-in with your username and password. Cancel any update messages you may encounter. Go to these menus: Tools -> Options -> Advanced. Uncheck both checkboxes (in Skype 4 it is only one) named Notify me and save the settings. Open any folder or Windows Explorer, type the following in the address bar: %temp% and press Enter. This will open the Windows temp folder where all temporary files are stored. If you see here a file named SkypeSetup.exe – delete it. 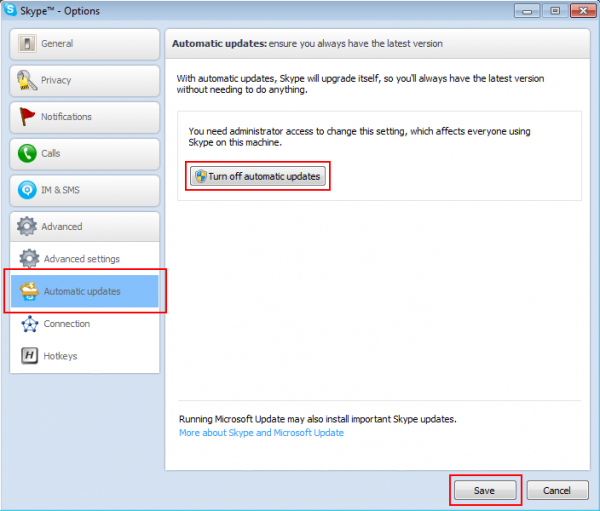 Disable the fully automatic Windows Updates. When you are asked which updates to install do not include the ones that have the word Skype in them. If you are currently in Skype – cancel any update messages you may encounter and quit Skype. Move the file that you just downloaded to the folder you just opened. If required – overwrite the existing one. Right click on the file, choose Properties, check the checkbox named Read Only and click OK.
From the menu go to: Tools -> Options… -> Advanced -> Automatic updates. Click the button Turn off automatic updates and save the settings. Thank you! A million times thank you! You are welcome :). Thanks for the comment. This is fantastic. Exactly what I need. I’m still using the last version of Skype that didn’t try to take up acres of window real estate (3.8) and it was continually bugging me to install later versions. I was able to get rid of that function where it takes over callto: links in Internet Explorer too. Hi. Cool. Thanks for the comment :P.
Hi. Thanks for sharing but this will not work with older versions, since the updater file and service are not used back then. Also I don’t see you explaining how to actually do it in the post. I really can’t stand these Skype update notifications; I updated my Skype last week and hated it and uninstalled it and reinstalled a full version from April 2012 which I like and want to keep and Skype was still sending these annoying update notifications and I found you a few minutes ago and applied your info. I have the Windows Update in Services set to Manual; is this the setting you recommend? Your tip does not work; I still get this annoying “The latest version of Skype is ready to install now” notification, and I do not want these freaking notifications as I do not want the latest [censored] version of Skype. It annoys me that programmers insist on fixing something that is not broken. Thanks anyway. The tips should work. Are you doing the right tips for your version? Can you tell me which version do you want to use and which windows do you have? Thanks, I had mine turned off but it still kept prompting me. Deleting SkypeSetup.exe was the bit I needed to know. Actually I have the same problem as Mark above. I ran skype again and the SkypeSetup.exe is put back in the Temp folder and the annoying message appears. Auto updates are turned off in Skype. What is your version? And are you doing everything from the article for that version? For example for the 5 version take a look at the steps. There is a way to make it that it cannot download the file to temp. Please note if you delete the SkypeSetup.exe in the %temp% dir, it will also stop popping the annoying notifications “Updates are ready to setup” that appears also if you have disabled the automatic updates (beacause before disabling them, they were downloaded indeed…). Just to make sure, I have also deleted the Updater directory under the Skype directory. You are welcome :). And I think you are right about the notification that apears. The Automatic Updates are turned off. But it still brings up a box that tells me theres updates available. There seems to be no way to disable checking for updates in the options. Is there a way to block the checking in the HOSTS file? Do the 9 steps and it will stop. Thanks a lot. It works man…….. Thanks very much – a good article but the SKYPESETUP.exe file doesn’t run on Windows 7. I have 6.9.0.106 on my Win 7 machine and it runs fine – except for the pop up windows on bootup wanting to upgrade. I DON’T want to upgrade. I put skype on a new laptop and got the newest version and am not assaulted by large ads (bigger than the video window). Thank you Microsoft for THAT “enhancement”. Is there a Win 7 version of the setup tool? Hi. There is some misunderstanding here. Are you trying to start the fake setup file I give in the article? This is not what it is made for. Please read the article carefully and follow the instructions there. This doesn’t fix the annoying “Do you want to upgrade now” dialog, which appears two times a day, since Microsoft took over Skype. Do you have a fix for that? Hi. What version are you using and what operating system? Have you done everything exactly as it is said in the post, including deleting the skypesetup file and putting the fake one and making it read only? I did everything as written above. I think that the new dialog isn’t connected to the skypesetup.exe app. I think it is built-in. I’m using Skype 6.11 on Windows 8.1. I haven’t tested on Windows 8. So you are using the desktop version not the app right? I am using the desktop app, not the Metro app. Thanks for the info. I still haven’t worked on this. So much to do, so little time. Hi. I tested this on Windows 8 (I think it is not 8.1 but it should be the same) and seems to work. First I installed 6.11 and signed in. Then I logged out and signed in again and it started to update. I clicked the red X on the update and then installed the 6.11 again because I think some files were gone because I stopped it. So this time I made the fake skypesetup file as it is described in the post above and also I turned off the automatic updates of Skype in the options. After I did this I tested it for some time and even updated Windows and restarted several times and still it did not updated. So I think this works. Nikolay, that is strange, because it is pretty much what I tried. I will try again. Thank you Nikolay. I will add all this to my Skype Old Version notes to stop updates. I came looking for new info and find yours NEW to me and my followers. I have noticed that removing Skype Update From Services (heres a video I made about it http://youtu.be/1HqWYr-c7Rc), did not completely remove the “Updates are ready” notices, nor has removing the Update Folder inside the Skype folder in Program Files. Having last logged in to v3.8 (and yes! it still works, even after MS forced all old versions to sign our, called them outdated or retired, and forced us all to upgrade)… I DID find a skypesetup.exe in temp folder, just as you instructed above. And I have now deleted it. Testing Skype v6.14, which usually does get the notice of new updates available, did not give me that notice. So I think it worked. Thanks! I do see now that the SkypeSetup.exe is back in the Temp folder, since I ran my 6.14. 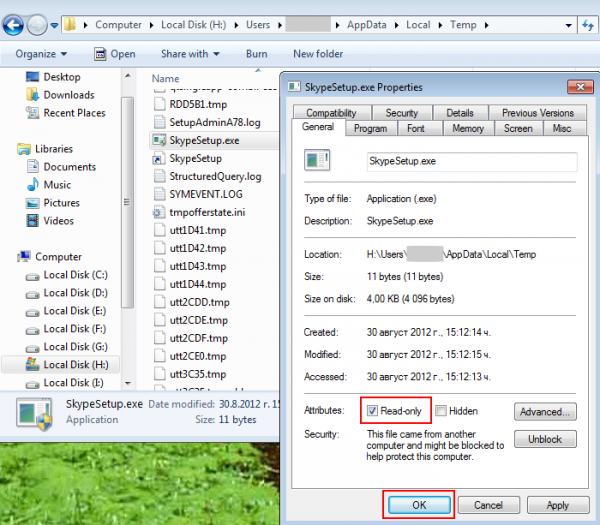 So I will try your fake skypesetup file and read only tip. Before I do though, do you mind if I ask how you created this fake.exe file? I tried creating a text file in the Temp folder, and made it Read only. Then renamed it SkypeSetup.exe, ignoring the warning message about changing the file name extension may make the file unstable. Do you think this will also work to stop the notices? Hi. Yes, this is how I made the file. there is still a point to this thread. People with 6.14 and 6.16, and those with 3.8 or 4.2 (the later 2 tested still work in Win7), they are all getting these notices. so they will still ask me how to stop the update notice. So this is still a very useful article and comments too. I have a feeling this time they are stopping all old ones for sure, but we will see :). I also have a feeling that the era of Skype is coming to an end slowly, just like the same happened with icq and mirc. The huge changes Microsoft did recently are generally good, but poorly executed. But that is a different topic :). I have not tested them and I will not be spending time on these stuff because I am kind of retiring from the Skype field and moving into some other stuff at the moment… But you can check it out if you want. Thanks so much Nikolay! I’m on Win7 and this saved my life, can’t believe they don’t address this as a bug. Luckily, your workaround exists.